This burly Kentuckian signed as a pitcher but made it to the majors with his bat. Jeoff (which rhymes with “off”) Long could hit balls a long way. 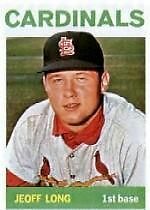 That got him into 56 games in 1963 and 1964 as a first baseman/outfielder, first with the St. Louis Cardinals and then with the Chicago White Sox. A bad knee limited his career, however – he first hurt it playing high-school football and reinjured it while with the White Sox. Jeoffrey Keith Long was born in Covington, Kentucky, on October 9, 1941. Covington lies just across the Ohio River from Cincinnati His father, Chester Long, and his uncle Oren were entrepreneurs. They founded the Long Brothers Bag Company in 1944; two years later they started Cincinnati Drum Service. Over the next several decades, Chester and Oren’s hard work built a remarkable little empire. It remains today a classic American success story. In his only game as a junior, Long twisted his knee handing the ball off. “I split the cartilage,” he recalled in 2008. “That was when I had my first operation. It wound up becoming an accumulation of problems. They didn’t have the medical technology back then – no arthroscopes or anything like that.” He stayed off the gridiron in his senior year. Three days after he signed, the teenager reported to his first pro team, Wytheville in the Appalachian League. An emotional Pauline Long said, “He seems awfully young to be leaving home.”5 Jeoff played in Virginia just briefly (0-1, 6.00 in three games) before going to another Class D squad, Keokuk in the Midwest League. He formed a battery with another Cardinals bonus boy who signed around the same time out of Tennessee: Tim McCarver ($75,000). Two other young men got lavish money (for the time) from St. Louis. Jim “Charlie” O’Rourke ($60,000) got two at-bats in St. Louis that June, and did not resurface for the remainder of his four-year pro career. Future University of New Orleans coach Tom Schwaner ($50,000) also lasted four years in the minors but never made the big leagues. “I asked my manager at Winston-Salem, Chase Riddle, if there was anything else I could do to help.” Thus the organization looked to convert him to a position player. Shortly after, “the apple-cheeked kid with the big bat, weak glove, and, we suspect, faked nonchalant attitude toward baseball” (as Blanchard described him)9 jumped to the Double-A Texas League. “The Cardinals . . . are highly interested in finding out what the big guy can do against tough company,” wrote Blanchard, who suggested that the organization might look to recoup some of its investment via the Rule 5 or expansion drafts.10 Jeoff hit seven homers and drove in 25 runs in 37 games for the Oilers, though his average was just .225 as he adjusted. The 20-year-old had a torrid start in 1962, cracking 16 homers in the Oilers’ first 31 games. Inevitably he cooled off after that, but he still finished with 30 home runs, 80 RBIs, and a .284 average. He added four more round-trippers in the playoffs as Tulsa swept Albuquerque, 3-0, and knocked off Austin, 3-1, en route to the Texas League title. Meanwhile, pal Harry Fanok’s Atlanta Crackers had won the Little World Series. To celebrate their success, the young men spent two weeks in Stuttgart,Arkansas – the duck-hunting capital of the world – pursuing their favorite hobby. After a stint in the Instructional League, Long was promoted again for the 1963 season, joining the Crackers in the International League. In 86 games, he had 43 RBIs while batting .274 – but he hit just five homers. There was a good reason for the dropoff, though. Jeoff noted, “They’d removed the inner cyclone fence, and that made it a lot deeper for a right-handed batter.” Indeed, Atlanta general manager Joe Ryan had removed the four-foot wire fence in July 196211, restoring old Ponce de Leon Park’s former cavernous dimensions (365 feet to left field and 448 to straightaway center, up from 330 and 410). Jeoff made his debut on July 31 as a pinch-hitter for Bob Gibson, striking out against the Reds’ Jim O’Toole. Over the next month, he pinch-hit four more times without appearing in the field. In his last at-bat that year, on August 27, Long got his first major-league hit -- a single off Jack Sanford of San Francisco. He remained with the Cards through the end of the season but saw no more action. Long then went once again to the Instructional League. He remembered in particular being on the field when the assassination of President John F. Kennedy was announced. There were happier memories of his autumns in Florida, though. “One year we had a great team – we won the league over Detroit, which had guys like Willie Horton and Jim Northrup. But my favorite memory is from an NL vs. AL all-star game. Eddie Stanky was the manager, and he wanted me to pinch-hit. I couldn’t find my bat, and Pete Rose said, ‘Here, take this one – it’s got a lot of hits in it.’ Sure enough, I lined a single, and when I came back to the dugout, Pete said, ‘See, I told you!’ ” Of course, Rose’s bats wound up with 4,256 big-league hits in them. Still, the rookie played only sporadically over the season’s first few months. His career highlight came on May 15, against the Milwaukee Braves in his second career start. Bill White’s streak of 284 consecutive games played, then the longest current run in the National League, ended with a muscle strain. Batting fifth, Long hit his only major-league homer, off knuckleballer Bobby Tiefenauer. The two-run shot in the seventh inning was “a towering drive that bounced off the top of the scoreboard in left field, over 400 feet away.”14 It snapped a 6-6 tie, and St. Louis went on to win, 10-6. Long got five more starts during May, two at first base and three in right field. From Memorial Day on, though, he saw only pinch-hitting duty. On July 7, the Cardinals sold him to the White Sox for an undisclosed amount to make room for Mike Shannon. It was a pivotal move for the team during its run to the championship, as Shannon took over right field. Lou Brock, who had arrived from the Cubs a few weeks before, and Shannon flanked Curt Flood in a revamped outfield. Long collected only five singles in 35 at-bats for the White Sox, driving in five runs. Together with his 10-for-43 mark for St. Louis, he hit .192. A start against the Los Angeles Angels on September 23 proved to be Jeoff’s last game in the majors. He finished with a lifetime average of .193. The Cardinals voted Long a half-share, $4,311.64, of the winners’ World Series money. (However, it appears his name may have been left out of the published lists by mistake!) He also got a half-share of American League second-place cash, $733.01, from the White Sox. On December 1 Chicago traded pitcher Ray Herbert to Philadelphia for Danny Cater. As part of the deal, Long was swapped for future major-league manager Lee Elia. He went from Indianapolis (Chicago’s top farm club) to Arkansas (then a Phillies affiliate in the Pacific Coast League). After that he rejoined Cincinnati Drum, becoming a foreman. Jeoff and Katherine “Kathy” Martin Long were married in June 1975; they had one daughter, Lindsay, who became a national champion diver at Southern Methodist University. Grateful acknowledgement to Jeoff Long for his personal memories (telephone interviews on March 20 and 21, 2008; e-mail update on November 2, 2011). Thanks also to Harry Fanok. 1 “Schoolboy Gets $70,000 Bonus.” Corpus Christi Caller-Times, June 21, 1959, p. 5D. 2 Blanchard, Don. “Goldeye Glints: He Came to Play.” Winnipeg Free Press, May 3, 1961: 44. 3 E-mail from Harry Fanok to the author, June 7, 2007. 5 “Mom Wept When Cards’ $70,000 Long Left Home.” The Sporting News, July 15, 1959: 2. 7 Blanchard, Don. “Goldeye Glints: The Trial of Jeoff Long.” Winnipeg Free Press, July 22, 1961: 48. 8 Blanchard, Don. “Cards’ Silvey Arrives, Goldies’ Lucky Charm?” Winnipeg Free Press, July 12, 1961: 47. 11 “Too Many Visitors’ Homers, Atlanta Takes Down Fence.” The Sporting News, August 4, 1962: 38. 12 Russo, Neal. “Flashy Flood’s Sock Shower Helps Whet Cards’ Flag Appetite.” The Sporting News, August 10, 1963: 8. 13 Russo, Neal. “Cardinals Look to Longshot Long as Long Ball Hope.” The Sporting News, February 22, 1964: 19. 14 “Cubs, Giants Cut Short All-Star Rest.” Manitowoc (Wisconsin) Times-Herald, July 8, 1964: 10-M.
15 “Cards Slug to 10-6 Win Over Braves.” Syracuse Post-Standard, May 16, 1964: 12. 16 “Injuries Hamper Jeoff Long.” The Sporting News, April 24, 1965: 30. 17 Russo, Neal. “Jeoff Long Undergoes Knee Surgery; Slugger Stakes Claim to Redbird Job.” The Sporting News, December 6, 1965: 20. 18 Wirth, Ned. “Do-or-Die Season for Guindon and Long.” The Sporting News, May 10, 1969: 39. 19 “Jeoff Long Doubtful.” The Sporting News, April 2, 1966: 34. 22 “Cisco Sets Trend.” The Sporting News, June 14, 1969: 36. 23 “Blast of 322 yard wins long driving championship.” Greeley (Colorado) Tribune, June 25, 1975: 14. 24 E-mail from Harry Fanok to the author, February 11, 2008.